Lawyers advise their clients in the fine art of dancing and prancing around the law. This document attempts to justify circumvention of the Nuremberg trials. Who does this document serve? Certainly not the people. The people do not want to be responsible for the deaths of innocents in other countries, the destruction of culture and infrastructure; the public does not want to pay for expensive wars; the public does not want to send their sons and daughters into the bowels of hell. War is hell. However, the velvet glove of public relations firms and the mainstream media, owned and operated by rogue non-government organizations – manipulates the public into calling for war and the military implements the plans made in secret by the same treasonous non-government organizations. The USA has been taken over, folks. The manual authorizes the killing of civilians during armed conflict and establishes a framework for mass military detentions. Journalists, according to the manual, can be censored and punished as spies on the say-so of military officials. 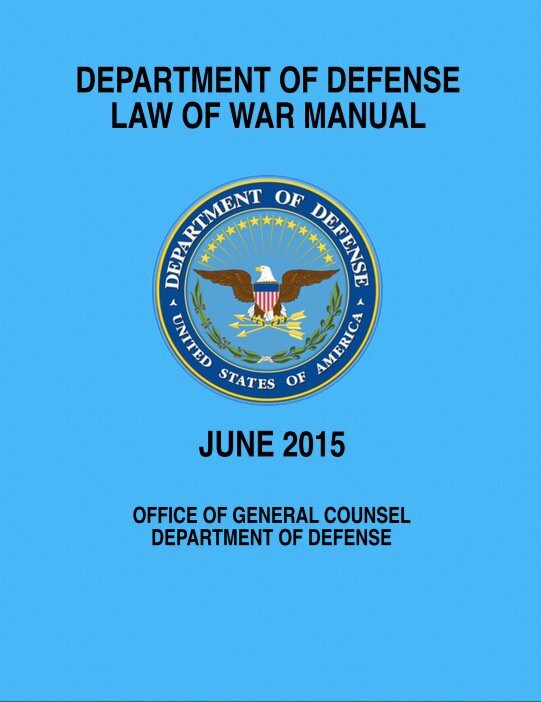 The manual freely discusses the use of nuclear weapons, and it does not prohibit napalm, depleted uranium munitions, cluster bombs or other indiscriminate weapons. The manual might have more properly been titled A Manifesto for Total War and Military Dictatorship.